The Marcellus Shale Formation, a Devonian-age organic-rich formation, is found under sixty percent of the state of Pennsylvania. The Marcellus Formation is the most prolific natural gas-producing formation in the Appalachian basin. Range Resources Corporation, one of the most active drillers in Pennsylvania and a member of the American Petroleum Institute’s Environmental Partnership, took measures to control dust and reduce surface impact. Fracking is the process by which a high-pressure water, chemical, sand mixture fractures rock and releases the natural gas inside. The fracking process involves heavy equipment and thousands of truck trips to transport water and chemicals to execute the hydraulic fracturing process. Additional trucks are required to get rid of the flowback water generated by the process. This intense traffic has an impact on local roads and can cause significant road degradation, dust, and offsite debris. Range Resources Corporation looked to Mustang Extreme Environmental Services – a distributor of FODS Trackout Control System and FODS LLC, for a way to address surface impact while reducing dust and debris from being transported off fracking sites. 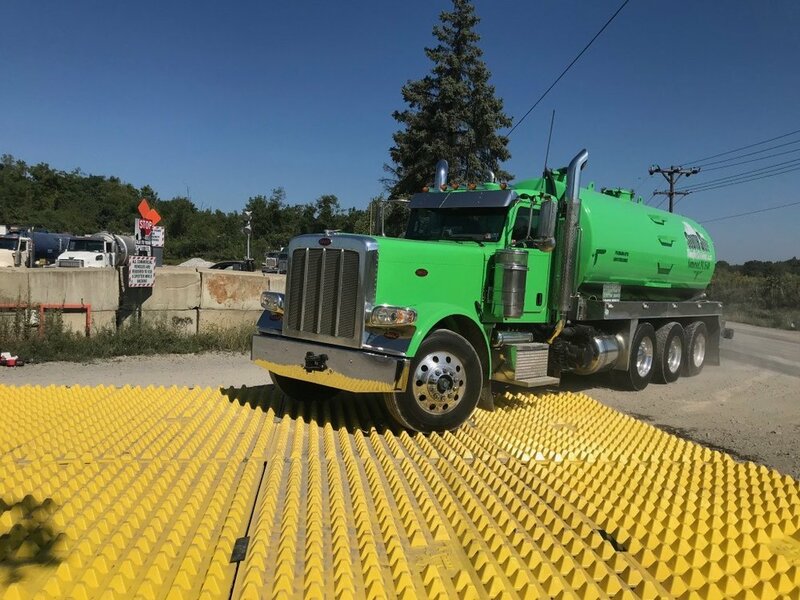 FODS Trackout Control System is installed using FODS twelve feet wide by seven feet long mats, which link together to create a uniform composite trackout control system. FODS mats consist of staggered pyramid structures that force open tire lugs causing debris to fall out cleaning the entirety of the tires. Once the debris is removed from the tires, it falls to the base of the mat where it remains undisturbed by subsequent vehicles. 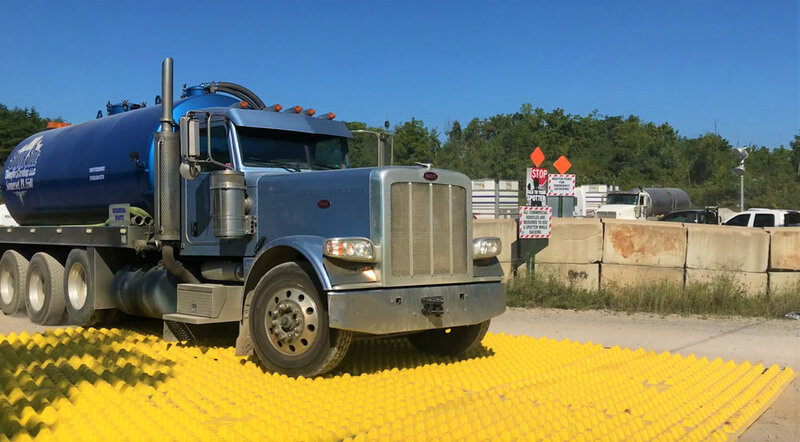 Range Resources Corporation used FODS mats as a temporary construction entrance to their fracking site pad. The FODS Trackout Control fracking site entrance was arranged in a 24 feet wide by 35 feet long configuration. FODS Trackout Control system for construction exits can be customized for site location and purpose. Overall, the Best Management Practice of using FODS Trackout Control Mats significantly reduced the amount of dust and offsite debris associated with Range’s fracking site trackout. FODS eliminated Range’s concern about liability of rocks being displaced on public roads, dust control, and reduced overall surface impact. FODS LLC delivered the promised benefits as a cost effective, rapid install, reusable, and durable environmental solution to Range Resources Corporation’s concerns. FODS, LLC is based in Denver, Colorado and is the manufacturer of FODS Trackout Control Mats. FODS mats offer the only cost effective and reusable replacement to traditional stabilized construction entrances which are typically constructed out of geo-fabric and large amount of aggregate. Working among many industries such as construction, excavation, urbanization, drilling, fracking, mining, utilities, renewable energies, landfills, agriculture, Nascar, trucking, airport, national parks, telecommunication, military, forestry, railroads, engineering, state and local government, FODS has successively shown an innovative solution to heavy equipment entrance and exit trackout.